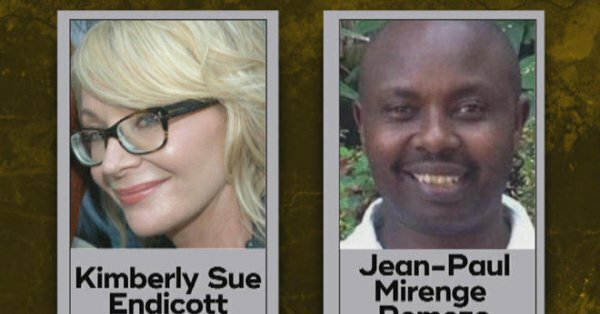 American Tourist Kimberly Sue Endicott and her tour guide Jean Paul Mirenge who were recently abducted in Queen Elizabeth National Park in Uganda, have been rescued and are now are in safe hands of the Ugandan security forces. This follows the incident that happened earlier last week in one of Uganda’s top safari destinations where Kimberly together with her tour guide were enjoying a game drive within the Ishasha sector of Queen Elizabeth National Park. The pair were abducted from a tourist vehicle which belonged to Wild Frontiers, a tour company operating tours and safaris in different countries in Africa. This happened as the two together with other two tourists were doing an evening game drive to spot the late risers such as lions and leopards that are common in the park. The two elderly Canadian tourists were left stranded in the vehicle after the gunmen took off with the car keys. The duo called the lodge that came to their rescue. The yet to be revealed kidnappers then started demanding money (ransom) from the lodge which is also operated by the Wild Frontiers of about half a million US dollar ($500,000) so that they can set the abductees free. Unconfirmed reports established that the captors have been reducing on the ransom and by Wednesday, they had reduced the ransom to USD400,000. After a series of negotiations, the duo have been set free and sent back to the lodge. The New Vision cited undisclosed sources, that a ransom of US$30,000 had been paid. There have been no incident of kidnapping tourists in Uganda have been very rare and this is one of the reason why the rescue mission some how delayed since there was no major clue to follow on determining who was behind these actions. However, the good news of the evening will help re-polish the country’s tourism sector that had been tarnished by the awful act.